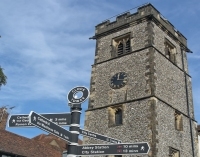 St Albans City & District Council is situated 20 miles from central London. It has a population of approximately 141,000 and an area approaching 63 square miles, most of which is located in Hertfordshire’s green belt. The main settlements are the historic cathedral City of St Albans and the largely residential town of Harpenden. The district has several attractive villages and hamlets including Wheathampstead, Park Street and London Colney, set in predominantly agricultural landscape and each with their own distinctive features and character. The district is an affluent area, with a strong historic identity, good resources and a vibrant and well-connected community. Within this context the Council provides a wide range of local services, placing a high priority on improving the quality of amenities for residents and visitors to the district. A number of key transport routes pass through the district, including the M1 and M25 motorways, the A414, A1081, The Thameslink route connects St Albans, Bedford, central London and Brighton. These ensure excellent connections to London and the rest of the country including Heathrow, Luton, Stansted and Gatwick airports, and now more recently with the direct Eurostar rail service to Paris and Brussels via St Pancras International. In addition there is a local branch line railway service – The Abbey Line, linking St Albans and Watford. The Economic strengths are based on green technology, independent retail, visitor economy and professional services. There are a number of popular attractions in the District which include St Albans Cathedral, Roman remains, medieval city, Heartwood Forest, Butterfly World, a number of award winning museums and an ancient charter market. The district enjoys strong strategic partnership and relationships between private, public and voluntary sectors.